Incorrect email-password combination. Please make sure your information is correct. We are unable to log you in. For more information, please contact M life Rewards member services at 866.761.7111. Please log in with your new credentials below. We sent a second email. Please go to your email and click on the link to change your password. The activation link you received has expired. Please click below to get a new link. We didn't recognize your verification code. Please make sure it's correct and it's from the most recent email. Sorry we are unable to update your account (profile mismatch). Please contact MGM Resorts Member Services at 866.761.7111 for further assistance. Unfortunately, we could not find your account. For assistance, please call 866.761.7111. Sorry, we were unable to update your account (system error). Please contact M life Rewards Member Services at 866.761.7111 for further assistance. The World of Hyatt membership number you provided is already associated with an M life Rewards account. Please contact MGM Resorts Member Services at 866.761.7111 for further assistance. Your M life Rewards account is already associated to a World of Hyatt membership number. Please contact MGM Resorts Member Services at 866.761.7111 for further assistance. Sorry, we are unable to update your account (interest code). Please contact MGM Resorts Member Services at 866.761.7111 for further assistance. Sorry, we were unable to update your account (token). Please contact MGM Resorts Member Services at 866.761.7111 for further assistance. Your M life Rewards tier cannot be matched at this time. Please contact MGM Resorts Member Services at 866.761.7111 for further assistance. Welcome, World of Hyatt member. Please Sign In to your M life Rewards account or Join Now to complete your tier matching. Sorry, we were unable to process your myVegas reward (system error). Please try again later or call the myVegas Loyalty Redemption Center at 855.881.6074 for assistance. This myVegas reward is no longer available to be redeemed on mlife.com. 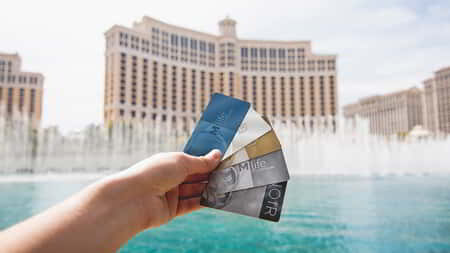 If you would like to modify or cancel a myVegas reward, please call the myVegas Loyalty Redemption Line at 855.881.6074. This myVegas reward is not available to be redeemed on mlife.com. Please call the myVegas Loyalty Redemption Line at 855.881.6074. This reward has already been redeemed. Please call the myVegas Loyalty Redemption Line Center at 855.881.6074 to modify or cancel your booking. This reward has been canceled. Please call the myVegas Loyalty Redemption Line Center at 855.881.6074. We are unable to match your myVegas profile to your M life Rewards account. Please call M life Rewards Member Services at 855.881.6074 for assistance. This reward is in refund. Please call the myVegas Loyalty Redemption Line Center at 855.881.6074. This reward has been refunded. Please call the myVegas Loyalty Redemption Line Center at 855.881.6074. This reward is in gifted status. Please call the myVegas Loyalty Redemption Line Center at 855.881.6074. This reward is pending email confirmation. Please call the myVegas Loyalty Redemption Line Center at 855.881.6074. This reward is on hold. Please call the myVegas Loyalty Redemption Line Center at 855.881.6074. This reward is in gifted on-hold status. Please call the myVegas Loyalty Redemption Line Center at 855.881.6074. This reward is unclaimed. Please call the myVegas Loyalty Redemption Line Center at 855.881.6074. You already have an M life Rewards account. Please sign-in with your M life Rewards account to apply for the M life Rewards MasterCard. Please enter your email address to begin enrollment for your M life Rewards account. M life Rewards is your ticket to access the best offers and the ultimate way to get rewarded for what you love. For your play, stay and everything in between, you can earn rewards for virtually every dollar you spend.